Towing Ravens, CA is the Best! Towing Ravens offers both long distance and local towing services. Long distance tows are necessary when your car becomes debilitated and you are far enough away from home that you can’t call your local tow truck company. Maybe you are on route from Oregon to California and you get into an accident and your vehicle cannot be serviced on site. You need long distance towing. Towing Ravens, CA can also arrange local towing when you have experienced an accident and your car cannot be driven. Local towing is necessary when your car needs to be towed within the Orange, CA area. Towing Ravens, CA offers you a great deal in price. We provide our customers with a pricing structure that is second to none. Just because we offer high quality service doesn’t mean you will be paying high prices. We also offer a lot of other great benefits. We have built a strong reputation within the Orange community because we have been faithfully serving the community for many years. At Towing Ravens, CA we know it is not just about the outstanding services we provide; it is also about the way in which we provide them. All of our technicians are friendly and ready to make you feel at ease. We are reliable in the sense that we will never make you wait long to receive the help you need. We can be there for you within 30 minutes. Our hours are endless. We are available to you 24 hours a day, 7 days a week. Out of gas? We’ll refill it. Punctured tire? We’ll repair it. Dead battery? We’ll replace it or jump start it. Need off road services? We’re there. Locked out? We’ll get you in. Is your vehicle light or heavy? It doesn’t matter because we can tow you anywhere, anytime. Out of gas? We’ll replenish it. 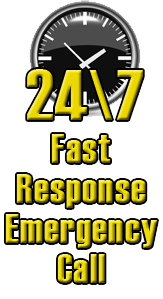 We handle all of your roadside emergency assistance needs.